Submitted by lynn on Monday, September 24, 2018 - 12:05pm. 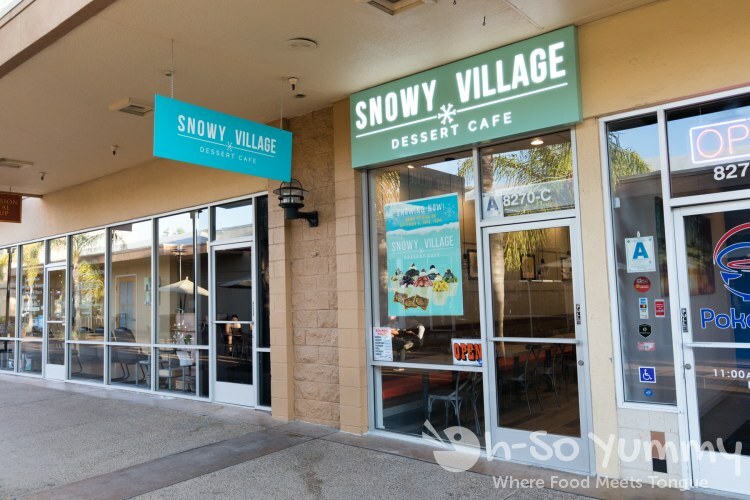 San Diego Snowy Village is a new dessert spot that opened up in Mira Mesa Mall, a few doors down the long corridor from Crab Hut Mira Mesa. One night we were craving Ding Tea but happened to run into a friend finishing dessert from Snowy Village. This interaction convinced us to change course from tea to snow! We also returned two weeks later to use $10 voucher won from a Facebook giveaway. During soft opening, the shop was completely packed but luckily, almost everyone was already eating. The line for ordering was fairly short but the kiosk to the left caught my eye. 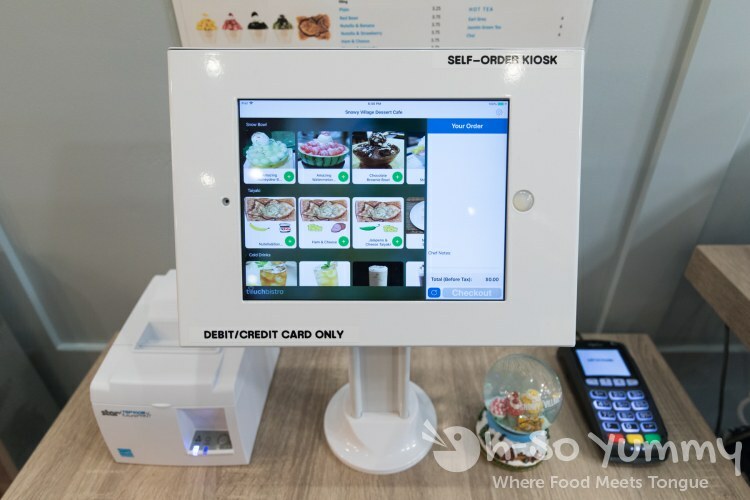 I preferred this ordering method because it showed pictures of the actual items and allowed easy to view customization. Once our order was placed, it only took a few minutes to complete with the beefed up staffing. It was still relatively quick on our second visit with fewer staff. 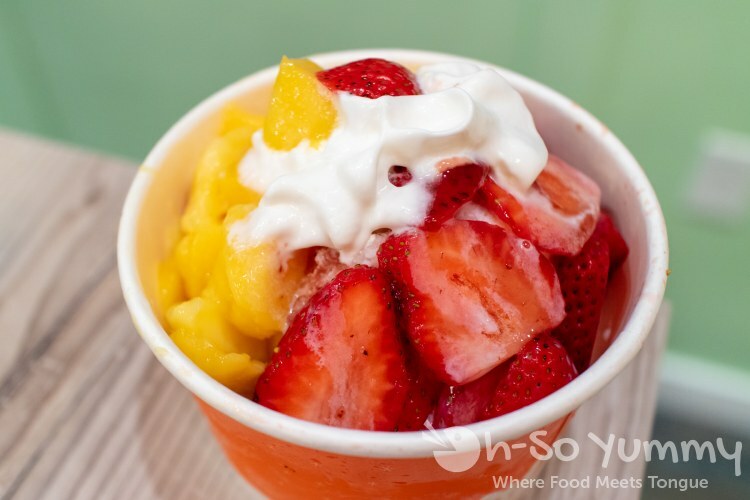 I love mangos and strawberries so I got the snow bowl with both! The fruits were ripe and tasted as expected. So far I love the taste of the snow here, which is surprisingly made of lactose organic fat free milk. It's just sweet enough for me and preferred over too cold ice kind of treats elsewhere. The finishing touch was whip cream which started melting quickly, at least for getting good pictures! We thought that the bottom of the cup seemed to have sugar crystals in it. This has been fixed since soft opening following some customer feedback including us. Our second visit warrented a different snow bowl. This large, sharable bowl used half of a watermelon! It's listed as a seasonal bowl but with SD's weather, will probably be around all year. 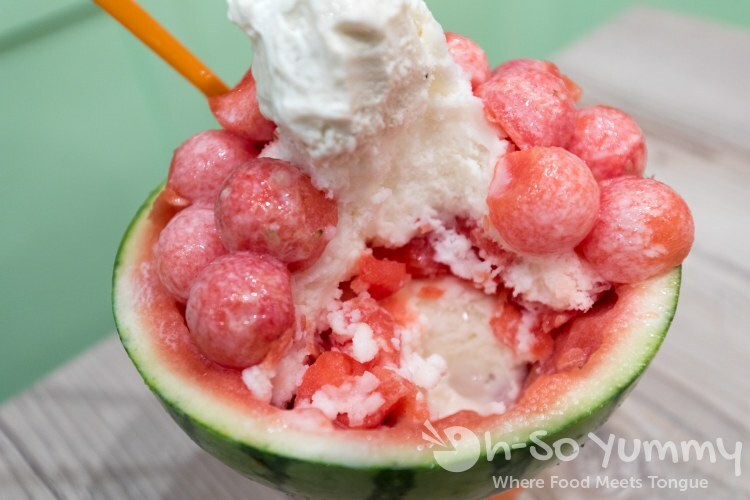 The layers are really cool, starting off with snow in the bottom, a layer of watermelon cuts, more snow, then watermelon balls. 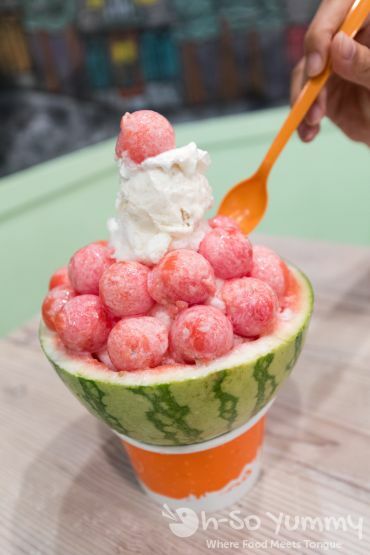 A scoop of ice cream is topped with one last watermelon ball! Be careful because our topper fell off when I moved it too fast for a pic! The watermelon is chilled because of the snow so it is super refreshing. After the snow was out, we scraped up the sides of the bowl, like what you'd do with a clam chowder bowl. They also serve a hot taiyaki treat here. During soft opening, we ordered this ham and cheese flavor. 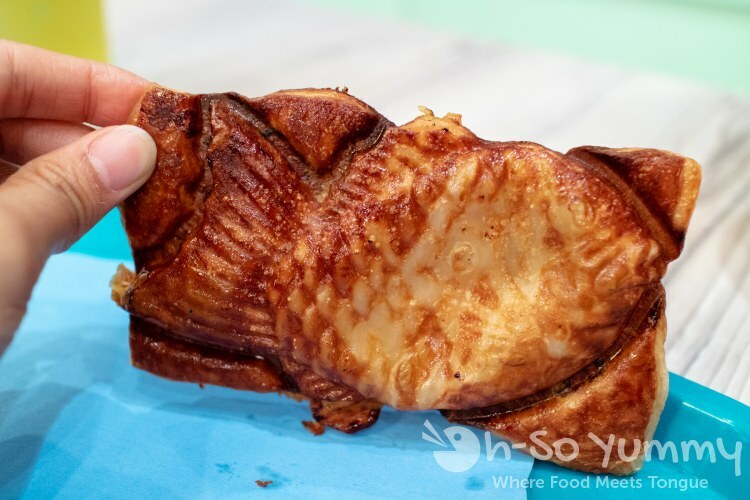 The outside was a flaky pastry with luscious layers that had been brushed with brown sugar before cooking, giving it a warm caramelized taste. 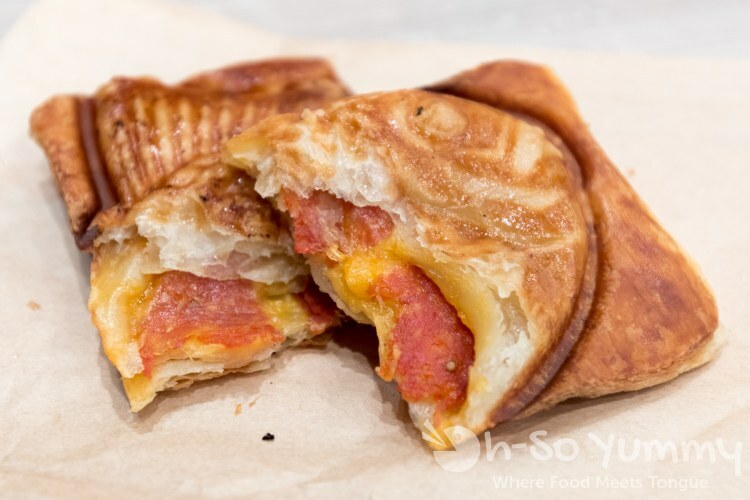 Inside was melty cheese and I thoroughly enjoyed this savory treat. On the second visit, the crust was lighter. The reduced brown sugar marinade is now added halfway through cooking for even coloring but I do miss that extra sweetness. The pastry is still nice and flakey and Dennis totally loved how this was a mini pizza bake! We should have ordered a second one because this is hard to share! Since we originally wanted drinks when we first stopped by, this cucumber cooler seemed to fit the bill. The syrups used here are made in house without fructose. 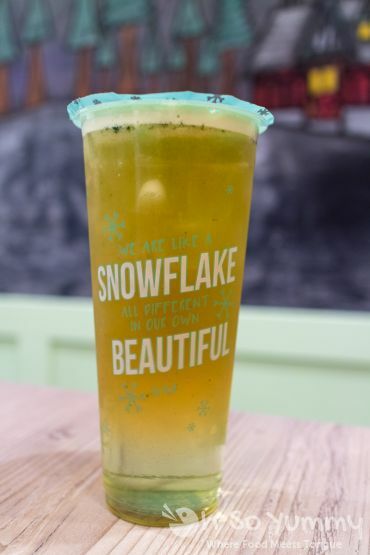 It was refreshing and not too cucumber heavy in taste. Without customization, the sugar levels were a little high so we'd do half sugar next time. On our return visit, we opted for a smoothie. I tasted mostly banana with just a hint of the green tea. The smoothie was a bit milkier in consistancy so I would have wanted it thicker. Dennis wished for a little more green tea. These drinks could be considered a bit pricey though. The layout is a bit of an L shape because the spacing is shared with next door neighbor Pokeland. 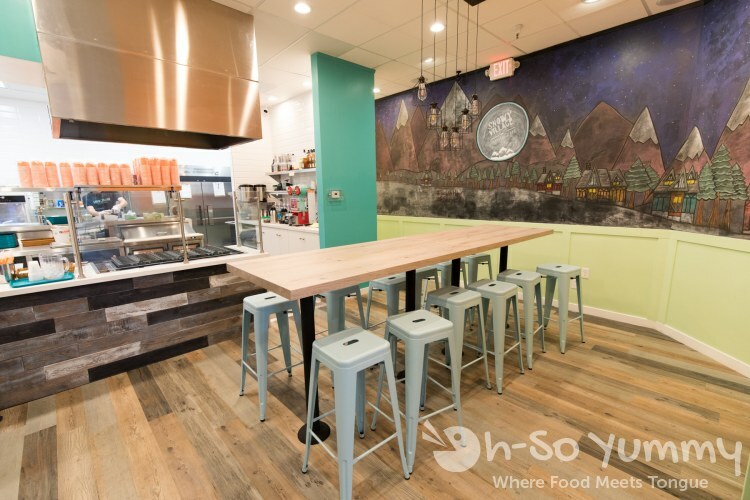 You walk straight toward the ordering counter and grab a seat where you like. They have this cool chalk mural to the right of the kitchen which was painted by a local artist (I'll add name when I find out). I can imagine lots of people doing their IG posts with this in the background! The owner Michael is super friendly, taking in all feedback to make his product better. The snow and taiyaki have already improved since our initial and most recent visit. 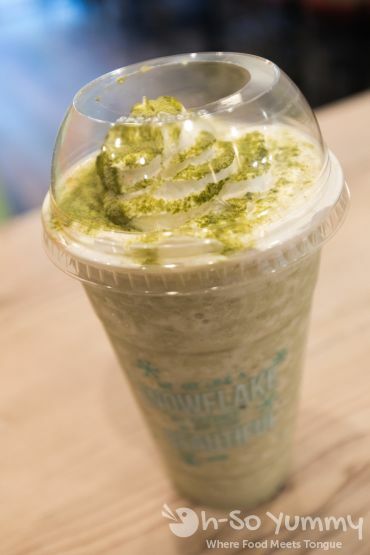 I noticed they have this chocolate brownie snow which is definitely next on my list! 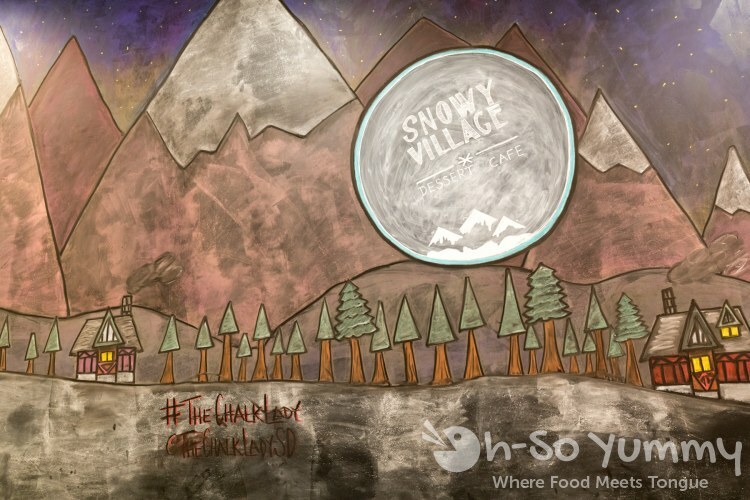 Snowy Village is also starting up a rewards program so you can earn discounts or free products if you come more often. Honestly, I love that people are hanging out more in this Mira Mesa plaza, especially with all the new restaurants popping up. 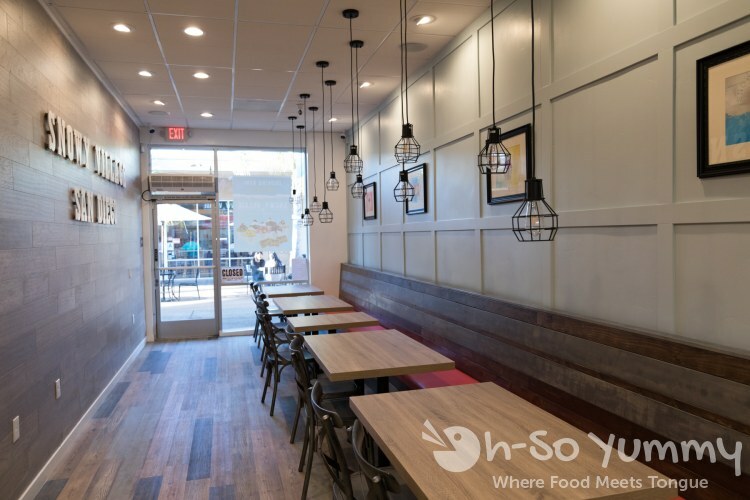 We're thrilled that Mira Mesa is changing for the better! 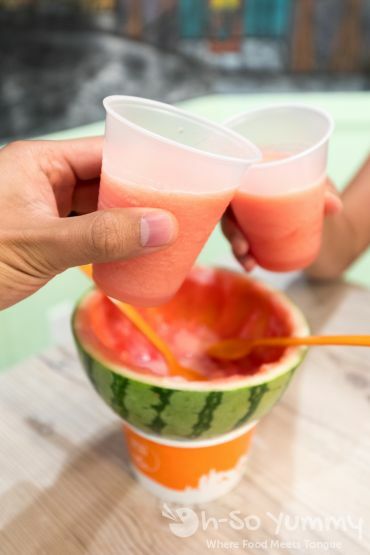 The watermelon bowl seems like a perfect seasonal treat and it's pretty too!